I wasn't really sure where to put this, but I'd like to set up a custom computer in the kitchen that we can use for quick and simple browsing, recipies, music, and maybe TV with a tuner. The goal, of course, is to use as little space as possible. There are some expensive options for Wintel machines, but what about macs? I'm open to any suggestions. Has anyone here done this? I would go with the Audrey. You can find them for under 100$ on ebay. Actually, I think that funny-looking computer in the background to the right would be a nice find. I did some research about that thing, Undertaker, and it doesn't seem impressive, even for $100. 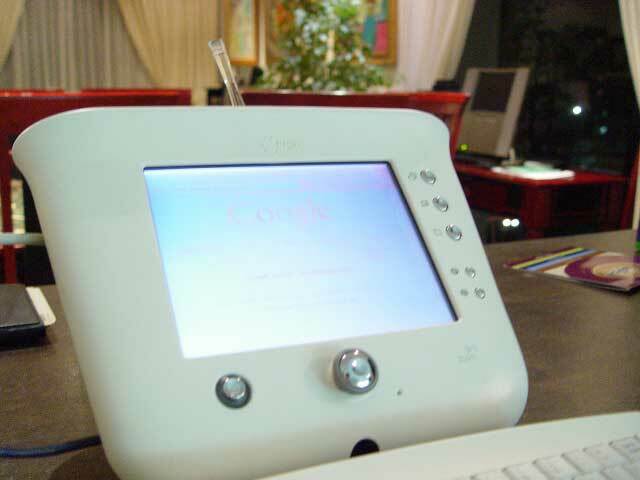 The Audrey has a 200 MHz generix x86-compatible chip and 16 MB of flash memory, but a touch-screen? That's quite a strange little device and certainly won't be able to do very much. Just how much are you wanting to spend here, rasmits? Just about any Mac you buy is going to cut into your wallet more than a generic PC. Apple computers hold their value like you wouldn't imagine. Used iMac G4s go for as much as $1300. There are several up on eBay right now, one for only $430 with 14 hours remaining. Also, will this be your first Mac? The tone of your post makes it sound like it. If that's the case, I might suggest that it would be quite an extravagant purchase for such a menial task. Macs are really meant for more than just browsing the web. Granted, some of the best web browsers are on Mac OS X, but they hardly complete the whole "Mac experience." If you are seriously interested in getting a Mac for your kitchen, I'd suggest looking around for a used 15" iMac G4. It has a small footprint, but you can't add a TV card. There are USB adapters for TV input, though. Our General Discussion forum is suited for purchasing advice. I'm moving this thread here now. Why not an iBook G3? I'm thinking that's where my wife's computer's going to go when she decides she's ready to move on to a new one. It can do all that you were hoping for with the exception of a tv tuner. Are there any USB or firewire tuners out there? Would a jellybean iMac be much too large a footprint for this purpose? Probably. However, that's how I have my tangerine DV currently in use. It's not literally in the kitchen, on my counter, but just a few feet away in the eating area, easily accessible from the kitchen, acting as a guest surfing/e-mail/iTunes jukebox station. I'm betting any slot-loading iMac could be found for pretty cheap, if you had a 1-foot square area to devote to it? The iBook thing sounds good too, but, like the iMac, the TV tuner thing is a no go without some sort of box, like EyeTV or Formac? In my house, the kitchen and the eating area (nook or whatever) run into each other. The kitchen is very large and there is a little cutout against one of the walls where a counter is with a phone, desk drawers from floor to 12' ceiling, and my old iMac 800 Mhz G4. It's the perfect place to keep a computer near by for calling up recipes and web-browsing for mom. We have a little TV sitting above the iMac, in its own TV cabinet. Last edited by Messiahtosh : 2004-11-12 at 10:12. Hmm.. that Audry looks kinda cool. My price limit is 500 dollars or less, I suppose. This isn't my first mac, I've been using them for a loooong time. (My first was an LC). I think a full featured iMac would cost a bit too much. I was thinking of just hooking up a touch screen to some spare mac I already had, and hiding the CPU in the cabinet while the screen was either wall mounted or tucked away. I considered a web enabled eMate, but those are a little much for the features due to their being a bit of a collecter's item. I'll look into that Audrey, but if anyone has anymore ideas or success stories, I'd be glad to hear them. If you can wait about 4 years... their will be a whole bunch of used G5 iMacs, perfect for the kitchen.